Everything Needed to EMPOWER a Community! REGISTER FOR YOUR MEMBERSHIP HERE! REGISTRATION IS NOW OPEN FOR SPRING LEAGUE. Click the link below to register your son or daughter for the upcoming season. Limited space is available!! National Junior Basketball has finally come to the Inland Empire. 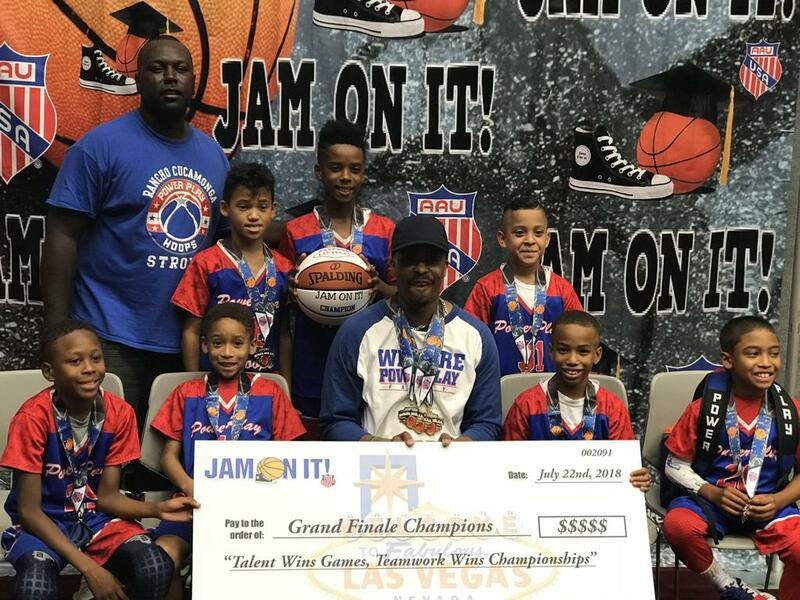 The cities of RANCHO CUCAMONGA, FONTANA and UPLAND make up the new Rancho Tri-City NJB chapter offering more opportunities for boys and girls from grades K-8 to learn and participate in the game of basketball. Winter league is wrapping up and new season begins in March! CONGRATULATIONS to 5/6 CELTICS and Coach Burciaga for bringing home the victory!! Our mission is to develop the talent of our youth by encouraging both physical fitness and strong mental health, healthy competition and personal responsibility while promoting positive self esteem, strong character and leadership. "EVERYTHING TO THE NEXT LEVEL"
For more details or to Register for PowerPlay Hoops Travel Ball Team, please click HERE! Without drive and ambition, I will not get far; With PowerPlay I will develop drive, I will develop ambition, I WILL EXCEL! Cost: $275/team **WIN SMACK DOWN Championship belt! If you need to pay your registration for a program but you are NOT a member of one of our programs including Empower Sports Facility, PowerPlay Hoops or PowerPlay Cheer, Please click below to register and pay. If you have experience running track or if you are new to track yet you have demonstrated an aptitude, ability and desire to compete in track & field at an ADVANCED level including National Junior Olympics, we invite you to try out. If you have questions or would like to try-out, please email us at powerplayfamily@gmail.com with athlete's name, phone and email. You are also welcomed to call us at 909.285.4301. EMPOWER SPORTS FACILITY is the new home to PowerPlay Youth Academy including the preeminent AAU Travel Basketball Club of the Inland Empire, PowerPlay Hoops representing Rancho Cucamonga, CA and nearby cities. Interested in becoming a sponsor of Empower Sports Facility? Assisting buyers and sellers with their Real Estate needs! Located in Rancho Cucamonga. Call 310.628.6731 Today! Premiere STAFFING company in the Inland Empire! Located in Rancho Cucamonga. Looking for workers? Looking for a job? CALL 909.581.1000 Today! Adidas is a proud sponsor of PowerPlay Hoops! IMPOSSIBLE IS NOTHING! Citrus Motors FORD, Citrus Motors KIA both located in Ontario Auto Center! Auto Sales and Collision Repairs...Call Today!